Popular Mechanics has some photos of the "the next generation Acura TSX." 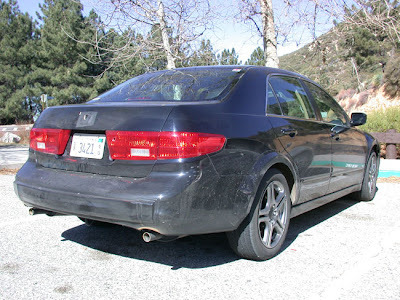 A group of Honda engineers were testing a new vehicle on the Angeles Crest Highway in Southern California. 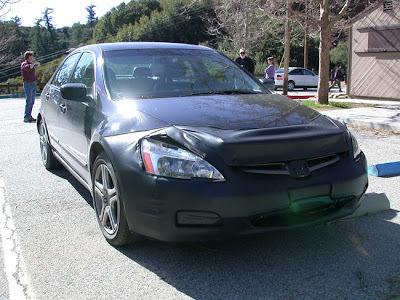 At first glance, this test mule looks like a current generation Honda Accord. But it’s not. Under the Accord’s skin is the chassis of the next generation Acura TSX... We suspect the 2009 model will again have a unique chassis from our own American Accord. A turbocharged four cylinder derived from the recently introduced Acura RDX crossover SUV will likely provide the motivation. Expect standard all-wheel drive and much swoopier styling when the ’09 model appears. Our sources say it will be a dead ringer for the Honda Sports 4 2005 we spied recently at the Tokyo Motor Show concept. Kind of a boring spy photo rumor if you ask me, aren't we just looking at the USDM Honda Accord? However, please don't shot the messenger, I'm only reporting what I see and read. I like what I'm reading though: turbo + SH-AWD + will look like the Honda Sports 4. Sounds more expensive than the current generation TSX, which is already pushing $30k.